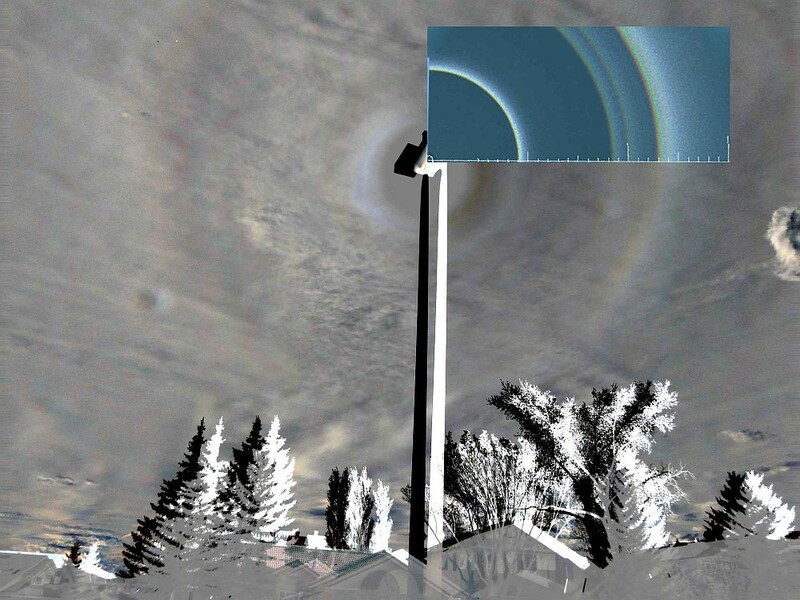 Halos from pyramidal crystals, including plate and column arcs, were observed by Andreas Möller on June 09th, 2018, in the East-German town of Schwedt at the Oder river. 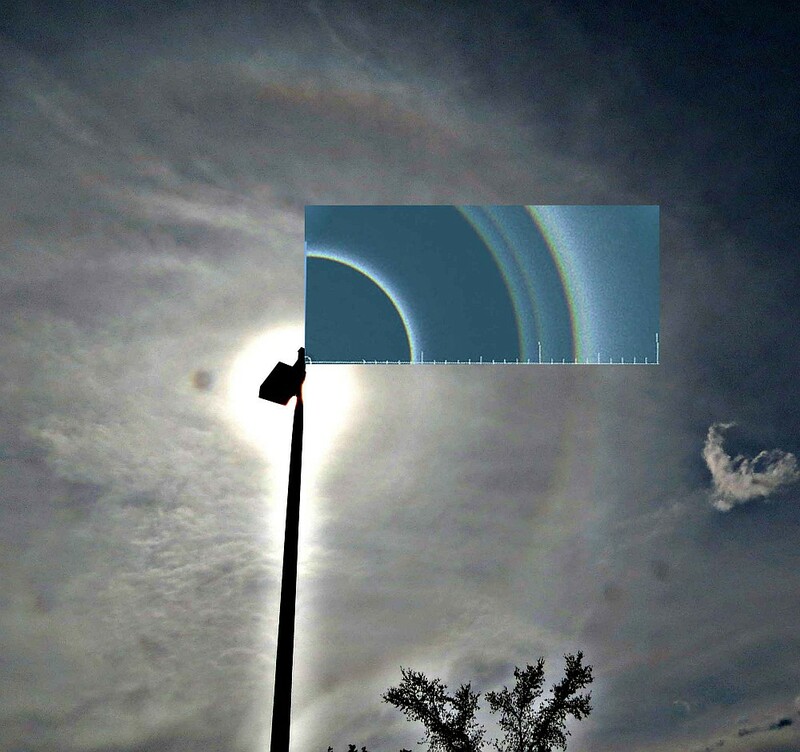 This feature fits to the contact position of the 20° column arc at this sun elevation (48°). Column arcs from pyramidal crystals are considered rare. Some excellent photographs from China have been published here recently. Interestingly, the sun elevation was also higher than 40° in these cases. Simulating this display requires some care. The crystal distribution was certainly not homogeneous, indicated by the missing left column arc. Thus the odd radius halos on the left side of the display are generated by a different crystal population than those on the right. The best one can do is try some kind of “compromise simulation” that shows a little more than the observation by filling some gaps on the left side. Remarkably, most of the halos can be simulated well using a combination of only a plate and a column set of crystals. The plate component is fairly standard, with a high Gaussian tilt up to 40° ensuring that most of the rings’ circumferences become visible, while maintaining the high intensity of the 23° plate arc. The shape of the column component was designed in order to suppress arcs which are not present in the observation. I dare not to vouch for aerodynamic plausibility here, and just add the speculation that these might possibly be the optical active parts of larger aggregates. The intensity distribution of the 35° halo is not matched well, but to fix this a third crystal component must be introduced. 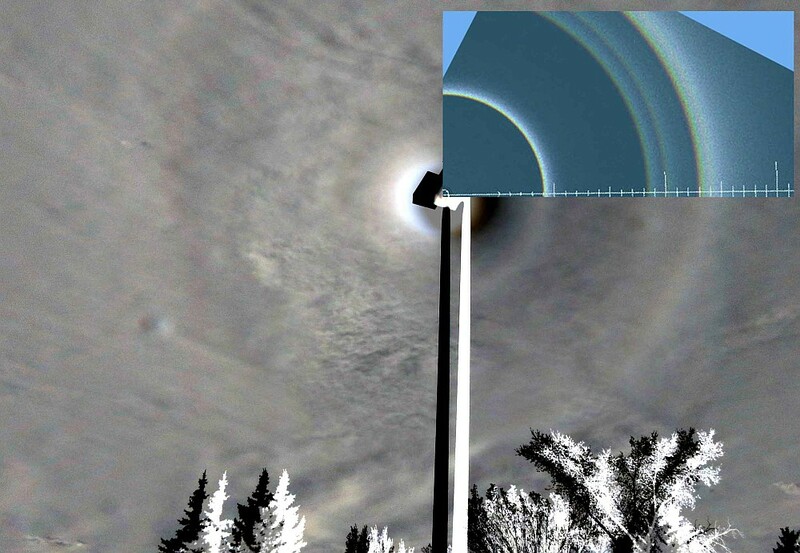 Circular halos of 12°-13° in radius are named “exotic” because they do not fit in the (nowadays) traditional sequence of well-documented halo radii from pyramidal ice crystals (9°, 18°, 20°, 22°, 23°, 24°, 35°, 46°). 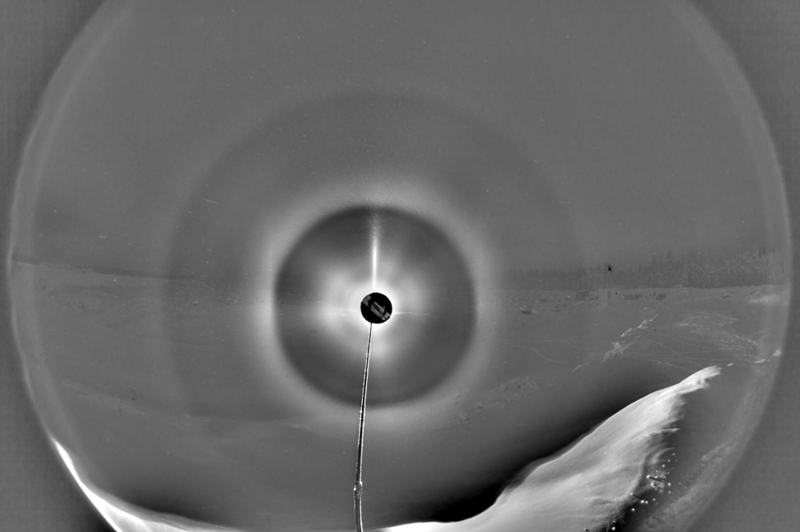 The first known photographs of such a halo were obtained at the South Pole, December 11th-12th, 1998, by Walter Tape, Jarmo Moilanen and Robert Greenler. Up to now, there are only few more (Michael Theusner, Bremerhaven, October 28th, 2012; Nicolas Lefaudeux, Paris, May 04th, 2014). 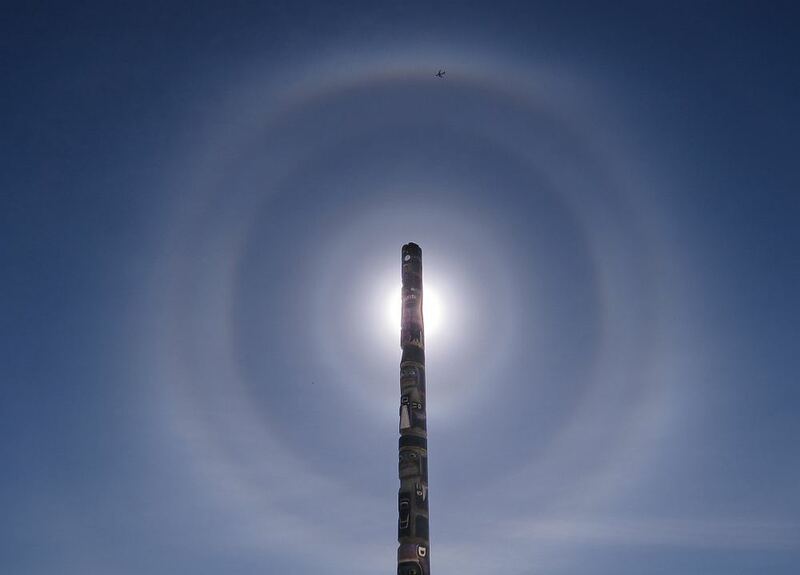 At about 3:16pm on May 4, 2016, with a sun elevation of 49 degrees, Alan Clark observed pyramidal halos from Calgary, Canada, showing a relatively wide 23deg halo, a distinct 9deg halo, and a hint of an 18.5deg component. A daytime maximum temperature of over 26°C on this day in Calgary broke long-term records. 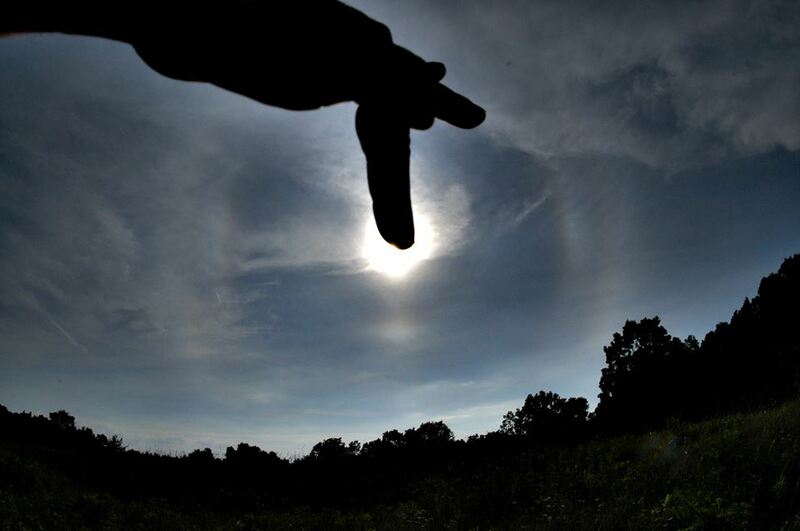 The within which The halo display was formed within cirrus cloud that preceded the arrival of a distinctive cold front. 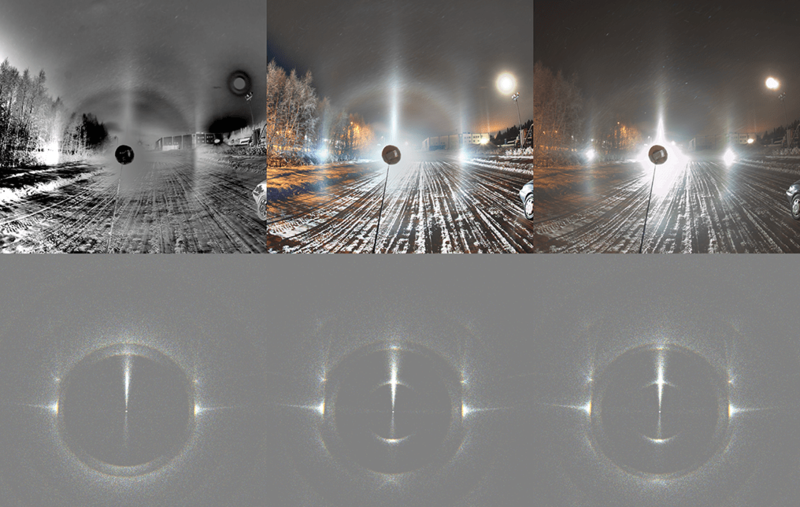 Alan also produced RGB intensity scans from these halo photos, showing the correct colour separation, with red inner colouring for these halos. This display is far from being impressive. But it has an interesting combination of odd radius halos: 9° and 35°. Not something that would be expected from your textbook pyramid crystals. We had several displays in such a style this winter. The display was seen on the night of 7/8 January in Rovaniemi in diamond dust that was being displaced by an increasing snowfall. The temperature at the official measuring site 7 km away was -27° C.
At around 2 p.m. on February 23, 2016 I was filming superior mirage of a distant land and superior mirage of a sea surface. From San Francisco the superior mirages are observed on warm days, and February 23 was not an exception. The air temperature was higher than 70 degree Fahrenheit. At some point I took my eyes from the horizon and looked up. The sight amazed me. 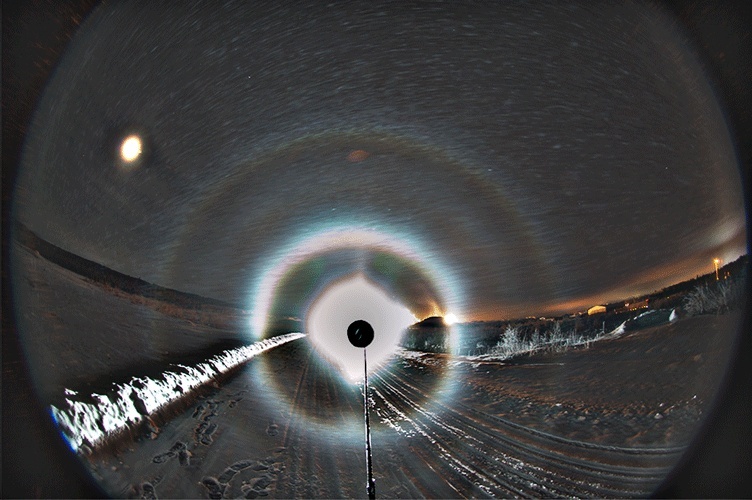 I was looking at bright, circular halos that I have never seen before. 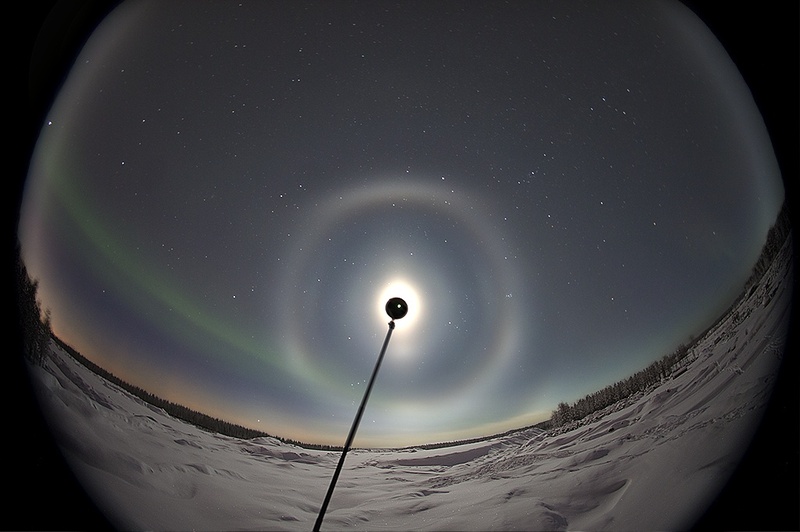 Later I found out that the halos I observed were 9 °, 18 °, 20 °, 24 ° and 35 ° radii, and 24 ° upper tangent arc. and that the display has a name: odd radius halos. From the pictures posted on the NET by other people I found out that a similar display was seen at Ballico, California, which is 50 miles (80 kilometers) east of San Francisco. 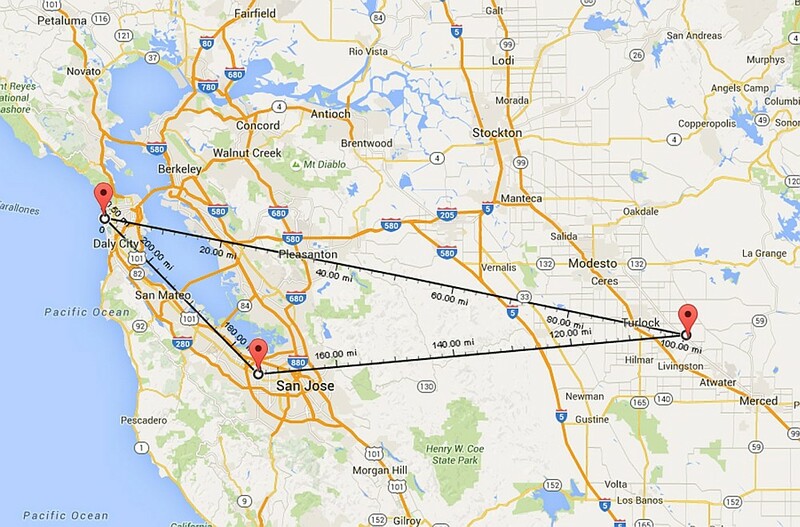 Another observer was located in Sunnyvale 20 miles (32 kilometers) south of San Francisco. It often happens that odd radius halos are observed over vast distances. As a matter of fact on April 14, 1974 the odd radius halos display in England was overdosed at the locations that were 460 kilometers apart. From Claudia Hinz I’ve learned that odd halos display in Middle Europe are associated with prominent cold fronts that slowly move from north to south, but no cold front arrived in San Francisco on the next day. February 24, 2016 was only slighter cooler than February 23.